I show these not because they are anything exceptional but because I was happy to find them. After moving from Alaska there were a lot of old woodturnings to deal with and somehow I managed to lose track of many of them. Just a couple of days ago I happened to look in a chest that sits beside my computer workstation and discovered the resting place of many of the missing. I picked out four that were roughly the same size and photographed them to show a bit of what I've done in this area. All of them are in the range of 5" to 7" but were made over a span of years. This is a pretty little item but mostly because of the spectacular piece of burl big-leaf maple it was turned from. 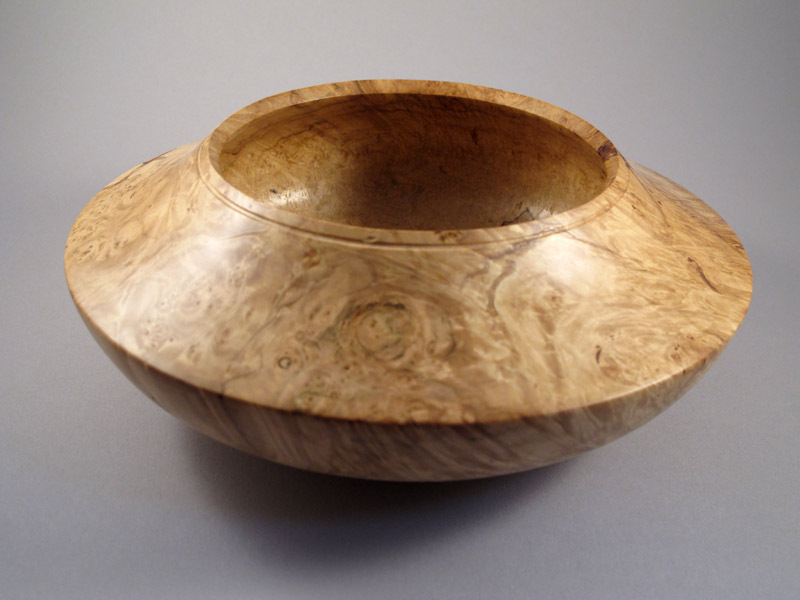 I used to pick up really high-quality turning blanks at John Hartvigson's shop in Anchorage; he had a source in the wood trade in the Pacific Nortwest which specialized in exotics and musical instrument woods. 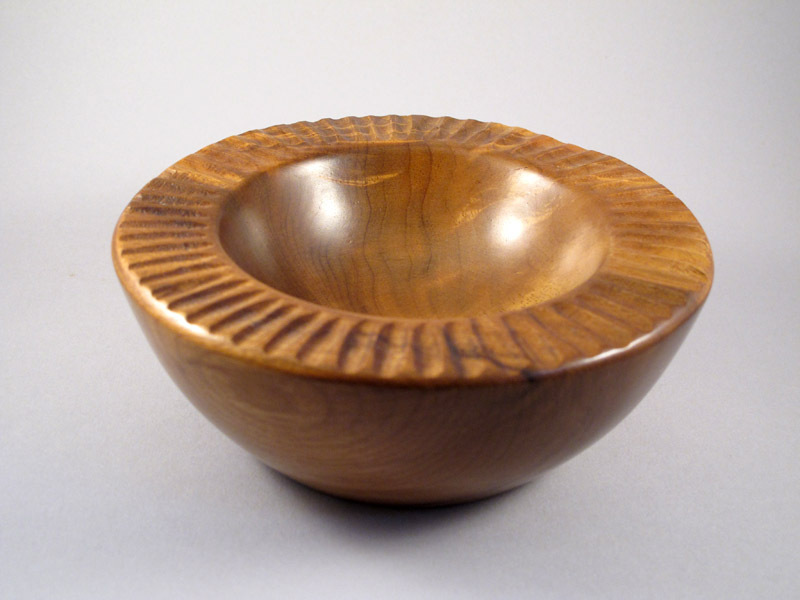 This bowl is made of bay laurel, an underapreciated wood which grows in a relatively limited area. Perhaps its limited availability is a good thing in that it has kept if from overharvest. I attempted some hand carving on the rim and it is irregular enough to guarantee that is is, indeed, done by hand.. This bowl is rather eye-catching. 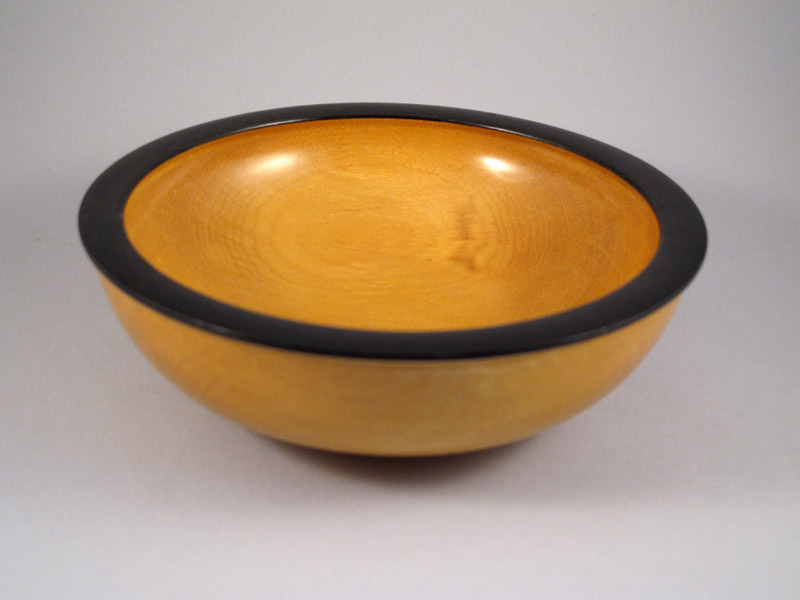 I racked my brain to remember the details and, at first, I thought that the black wood on the rim was gaboon ebony but now I realize that it is actually dyed/ebonized thick veneer bought many years ago from Constantine's in New York. If it had actually been ebony it probably wouldn't have survived the intervening wood movements intact. The main wood is, if I recall correctly, real satinwood. This bowl is interesting in its oddity. The wood is lignum vitae or "wood of life", an incredibly hard dense wood that has been used for a multitude of purposes including bearing blocks for steamship propeller shafts. It is naturally saturated with a resin giving it a good smell and supposed medicinal qualities. The wood is probably the most dense in common trade and will sink if placed in water. 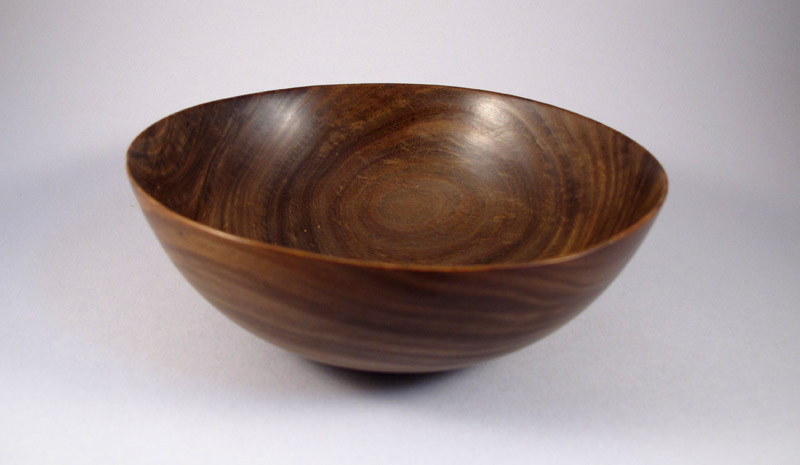 This bowl has no foot or base and is totally curved on the bottom which is a bit thicker than one might desire in normal designs but this makes it completely stable -- tip it and it will always return to the level after teetering for a while. It reminds me of an alms bowl. There are many ways to get to essentially the same end. Some day I may find the time to sort through the 30+ turnings in that chest to see if there are any that still please me as they once did.